stuffed it into one tiny storage unit and then wrestled 6 large suitcases across the country on the Wednesday before Thanksgiving (aka the most hellacious travel day of the year). It was kind of a bear with one semi embarrassing freakout involving me and a loose luggage cart wheel but we did it and landed happily in California with most of our sanity intact. The downside of course, is that between madly cramming our lives into boxes and bidding adieu to our city, blogging kinda took the backseat. Not to worry, though ... We're back! And we're back with dessert. And chiles! And chocolate! Truth be told, I developed this recipe back in Chicago almost a month ago. During what spiraled into the great farewell Chicago binge fest of 2014, Sarah and I stopped into Xoco for a mug of Mexican hot chocolate (... and churros ... and apple empanadas). It was warm and rich and spiked with chiles and made me a) want to visit Mexico b) not leave Chicago and c) use all the chiles I still had left over from the Texan Red and the Eggs Cocotte with chocolate ... somehow. Inspiration struck as I was cleaning out our pantry and encountered a huge bag of raw cashews, totally unused and forgotten. Sad because cashews are delicious (and expensive) and should be enjoyed, not tossed out in a harried move. 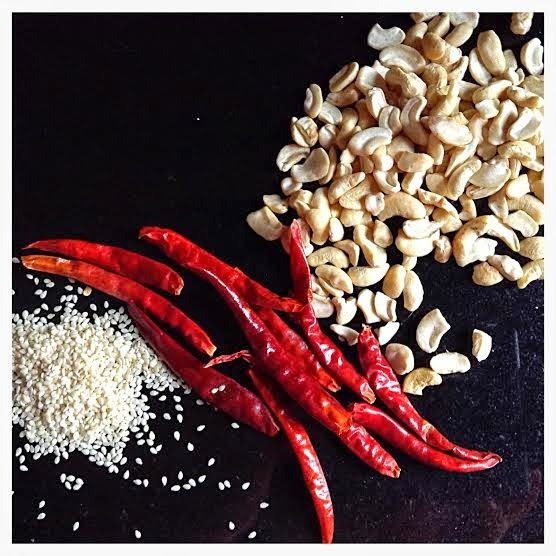 Luckily, they go great with chocolate - especially when they're roasted and candied and sprinkled with sesame seeds and ground chiles. Yep, it's pretty much the best way to eat cashews! I rescued our mini tart pans from the "to donate" pile (sly Sarah, very sly) and set to making a tart that celebrated the hot chocolate of Xoco and the remnants of our pantry and spice cupboard. Frankly what I ended up with was pretty amazing. 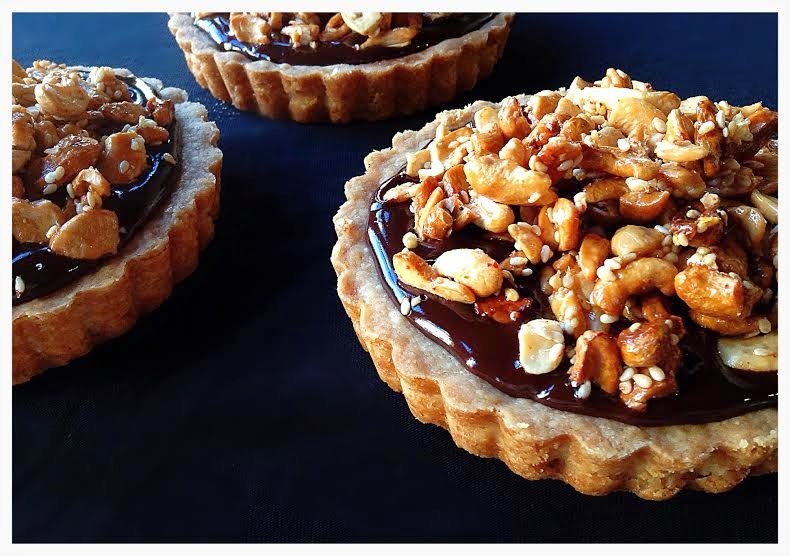 Dark chocolate ganache, warm chile notes, candied cashews, buttery pastry crust. A tart to behold! Let that be a lesson about using what one already has in ones larder. 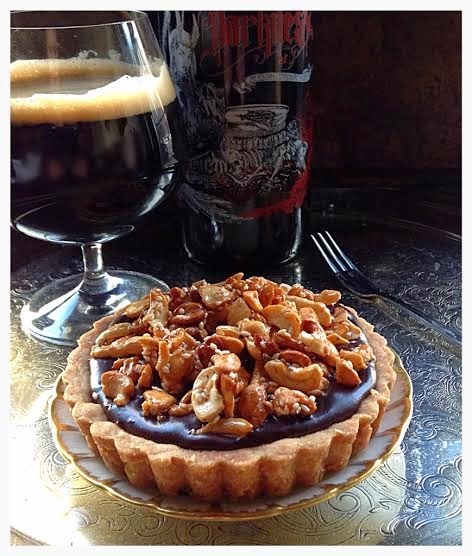 The tart was so incredible in fact that I deemed it worthy to pair with a really special beer. Like a really, really special beer. Surly Brewing Co's Darkness to be exact. Yeah, I got one of those. Jealous? I know I have been every other year I didn't get one. It took a hook-up in the form of my great friend, who's going away present was a terrific weekend in Minneapolis, one spot in the VIP Darkness line (read: no wait) and one highly coveted wristband (to get said Darkness). I can't say who he is - insider perks this good must remain covert - but he's a hell of a guy and I'll miss him! I debated heavily about whether to open this bottle for the tart. I knew it would pair well but part of me wanted to bring it to California where it could be enjoyed post move. It IS a bottle that warrants celebration. Maybe that's the hardest part of moving for a beer collector, actually. What to save, what to gift and what to desperately gorge out on pre move because you just can't stand letting it go. In the end the part of me that wanted to drink it - and also the part that felt anxious at the thought of hapless TSA agents handling such precious cargo - won out. And it was the right choice because this pairing killed it! Really, it was perfect. It takes a pairing like this to remind me that squirreling away ones finest bottles isn't always the best method of beer collecting. Sometimes it's just time to drink and enjoy them! I guess I should sheepishly apologize here because after all the above waxing, chances are most readers won't be able to get a Darkness with which to pair. Unfortunate but not to worry - there is plenty of other beer that will work well. Old Rasputin from North Coast Brewery, Yeti from Great Divide Brewery and The Black Ops from Brooklyn Brewery would all pair nicely and certainly be easier to procure. Preheat the oven to 375 degrees. In a small pot combine the sugar and water over medium heat and reduce for 10 minutes. Add in sesame seeds, salt and chili. Turn off heat and pour over the cashews, making sure to cover all the nuts evenly. Lay coated nuts on a sheet tray covered in parchment paper and bake for 20 minutes or until the cashews have toasted well. Set up a double boiler and melt the chocolate slowly, stirring constantly. Place the whole chiles and the cream in a sauce pot and warm over medium heat for about 4 minutes. Do NOT let the cream boil. Remover the chilies from the cream and slowly pour into the melted chocolate, stirring constantly to keep the chocolate from seizing up. Once the chocolate is a smooth texture, add the ground chili and salt. Mix well. 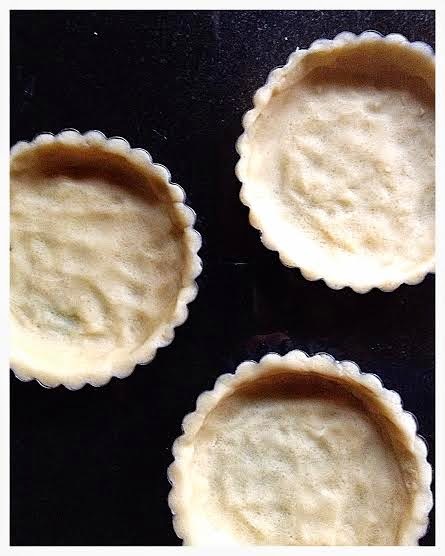 Pour warm ganache into the pre-baked tart shells. Generously pile candied cashews onto warm ganache, pressing down gently but taking care not to press so hard that the ganache spills over. Refrigerate for 2 hours so the ganache and cashews harden. As mentioned above, the Darkness is a special beer. It's almost jet black in color and has a full spectrum of aromatics that range from coffee, cocoa, raisins, and even caramely bourbon. This spectrum continues onto the palate, though the chocolate and coffee notes are most pronounced. Surprisingly, the large amount of hops actually pop through to provide a great balance with bitterness to counter the sweet, heavy body. The pairing provides a nice blend of both like and contrasting flavors. The buttery quality of the tart shell is contrasted by the bitter hops as is the richness of the cashews. 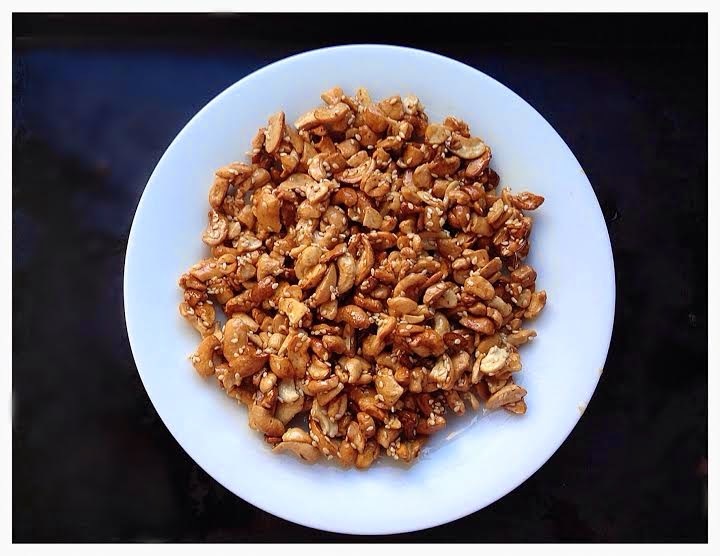 Like flavors are found in the toasted cashews and sesame seeds which also match the rich maltiness of the beer. Another interesting interaction is that of the different chocolate notes and how they play off each other - the bittersweet ganache becomes sweeter while the more milk chocolate flavor of the beer takes on more balance as they are combined. Perhaps one of the most exciting aspects of this pairing was the way the spice of the chiles heightened the alcohol in the beer. Darkness is a strong beer already but the chiles working in tandem gave it even more of a pleasant boozy finish. Ugh…moving is such a pain! AND you did it around the holiday!? Cheers to you on not completely losing your mind! That being said, congratulations on the new place and what a wonderful dish to celebrate! I love the combination of chocolate and chilies - it's like a match made in food heaven! Your beer pairing sounds incredible too! Coffee notes with chocolate/chili flavors - amazing!